This photo was taken at the Broadway Winchester where so many others were taken over the years by a great many other enthusiasts I believe that it was taken in the mid seventies. 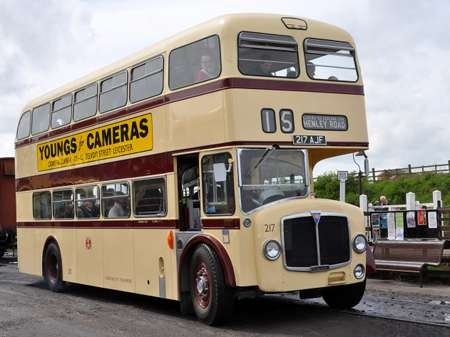 This bus was one of King Alfred’s second pair of AEC B3RA Bridgemasters with H45/29R bodies delivered in September 1961 the first pair being delivered in October 1959 followed in June1964 by a pair of Renowns both of which are preserved by FoKAB. A full list of Bridgemaster codes can be seen here. Whatever the reason, re-reading Alan Townsin’s Blue Triangle, it almost seemed as if there was a self-imposed death wish with strategic planning at Southall – which ran straight into the arms of the grim reapers of Leyland. Why didn’t they develop a Bridgemaster height version of the RM? Why did they cave in to BET with the redesign from a classic to a classically dreadful design? Like Alan Townsin I am a sometimes critical lover of the Southall thoroughbreds – but I hold my head in despair when I see highly respected modern manufacturers who seem to revisit the same sorts of crass stupidity 50 years on! May I be allowed to say, or venture, or whisper that in its time the Bridgemaster was a fashionable design. Domey curves were out and the cantilever-looking front end was cute. What will our successors say about those curvy black glass bits today and as for the back end of the Borisbus…. all it needs is a dorsal fin! Nice view, Dave. 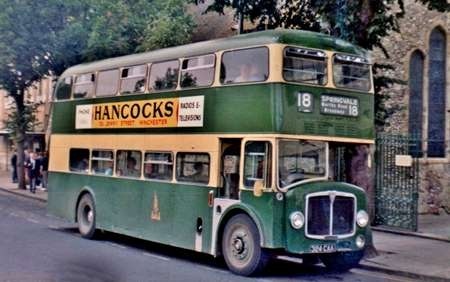 The bus doesn’t appear to have any of the Hants & Dorset features which were applied almost immediately when H&D took over KAMS in 1973, so this photo would have been taken, at the latest, mid April of that year. I have to agree with David about the Southall death-wish, but I take the opposite view of how it manifested itself. 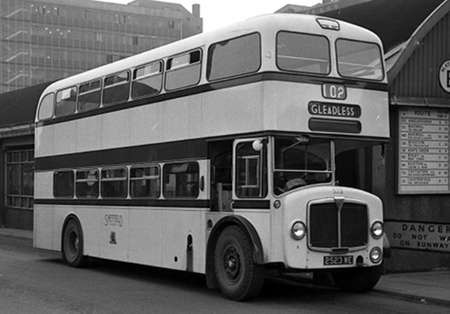 Mechanically there was a lot of Routemaster in the Bridgemaster, and that was what put some buyers off – particularly the integral construction, and even more particularly the lack of choice of bodywork that that entailed. The Routemaster could not be sold on the open market because it was too complicated and too expensive, so why build a lowheight version? As for styling, they had to capitulate to BET because BET was The Market. 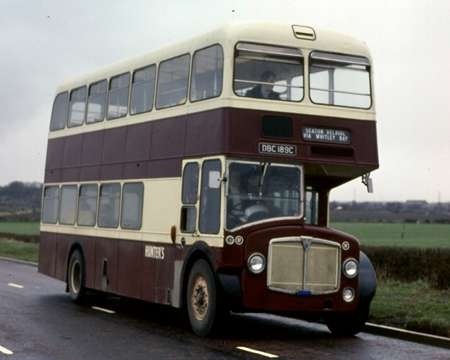 The number of municipalities needing lowheight double deckers was limited, so if they couldn’t sell the Bridgemaster to BET, it was hardly worth having developed it in the first place. What was really needed was a lowheight Regent V. That eventually happened in the form of the Renown, but as well as coming far too late, I have been told that even that was over-engineered. All very true, Peter. Perhaps the Renown/Regent path should have explored from the start. Those who stuck with the old (Renown) rather than the new (Fleetline) were certainly loyal fans. Unfortunately, by that time (especially with deckers) AEC was a busted flush. Merged? I think not. An unashamed plug, I know, but if you’re within striking distance of Winchester on New Year’s Day the biggest-ever King Alfred Running Day features among other delights the 1935 Albion Victor 20-seat coach AAA 756, whose return to Winchester was celebrated in April. Another reason to come: 2014 is to be the last Winchester New Year’s RD; it will be replaced by a smaller-scale event each April. 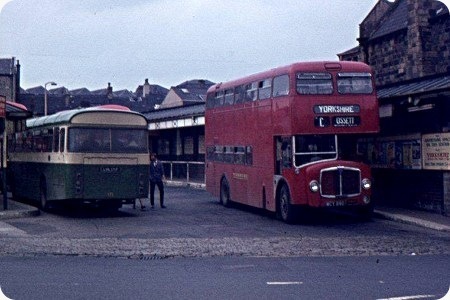 Now here is a shot of a bus somewhat out of its area, the photo of this South Wales Bridgemaster was taken in July 1969, in Dewsbury Bus Station. At the time it was working on Yorkshire Woolen district routes you can see the top blind displaying ‘Yorkshire’. I am not sure why YWD would need to hire/buy something so non-standard as the above for their fleet – shortage of vehicles for some reason perhaps or late delivery of new ones? I would be interested to know the answer – no doubt someone will know and let me know. Also in view is a 1967 West Riding Marshall B51F bodied Leyland Panther PSUR1/1 registration LHL 171F fleet number 171. The reason why Yorkshire Woollen had these Bridgemasters was due to a severe shortage of buses.Later Bristol K double deckers were acquired from West Yorkshire and United Auto. Thanks, Chris and Philip, for confirming that YWD needed to buy additional vehicles because of a shortage of buses. I think most enthusiasts know they had those problems, but how and why did they occur? Every operator’s fleet needs eventually to be replaced, and YWD would, (or certainly should), have had a well-established renewal programme, as did all BET companies. That was standard policy throughout the group. So what caused the ‘severe crisis’? Chris and Philip Thanks for the answer to my query – as you probably guessed, this was taken at the same time as the West Yorkshire K5G already posted. With regard to Roy Burke’s comment, the reason these things occur is generally twofold firstly manufacturers delivering buses late; secondly and particularly when the old CoF system was in operation a larger number of buses than that planned for could need replacing. Of course the third reason is rarer but most to be feared: prohibitions on running vehicles by the Traffic Commissioner. Some fleets seem more prone to vehicle shortage than others. at SMT/SOL/Eastern Scottish it seemed to be endemic. Here we are talking about Yorkshire Woollen and I have a captcha ending in HD. I am of an age that remembers the South Wales Bridgemasters coming to Yorkshire Woollen. The first one I saw was on the B&C services to Ossett from Fir Cottage and as someone who loves AEC buses and (Regent Vs) and still does it was hard to work out what was going until a really nice conductor told me saying "E lad we getting assorts coming, God knows what next" at this time various buses turned up on these routes ex Sheffield Atleanteans with I think regarding plates that began with BWB and buses from West Yorkshire which seemed to stay on the Thornhill Bristall A route but really at that time I think there was quite a shortage of new buses coming into service and as long as a bus turned up you didn’t bother where it came from but as a bus enthusiast it was paradise goodness knows how Central Works at Dewsbury knew where to find spares for them.